Located in a quiet area on the outskirts of the city, two Bratanki Inn offers guests organizations events and offers modern and comfortable rooms. At the request of our guests we serve breakfast in bed. Breakfast sets to choose from the menu of our restaurant. 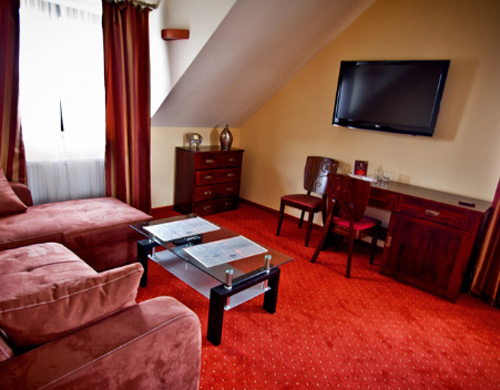 Two Bratanki Inn offers guests 21 comfortable and well-appointed rooms, including rooms 1,2,3 - cars and apartments. Guests looking for more luxury can choose suites with individually controlled air conditioning. All our rooms are equipped with private bathroom with shower and hairdryer, air conditioning and an LCD TV with cable channels. The rooms also have a ground wire and WiFi Internet. 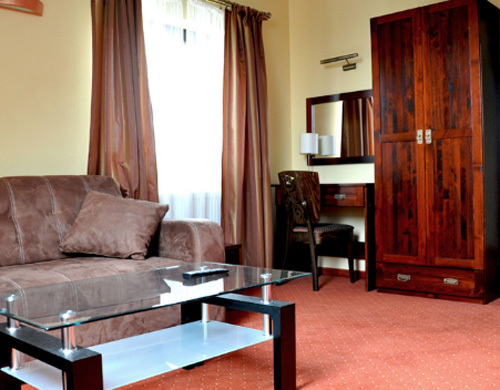 The apartments also have a spacious bath, refrigerator, kitchenette and separate bedroom. In the morning guests will enjoy a delicious breakfast. On request breakfast can be served in your room. Inn and Hotel Two Bratanki has two parking spaces for guests, where you can safely leave their vehicles. The hotel's restaurant offers dishes of traditional Polish, Hungarian and own production of pizza. Restaurant creates a friendly, family atmosphere that makes guests will spend a memorable stay. Food served in the restaurant are prepared on the spot, with fresh ingredients by experienced chefs. This makes them very tasty and healthy. During the summer there are open-air terraces of the beautiful greenery where guests can enjoy the taste of food. The hotel offers a kitchen grill on the terrace, where chefs prepare dishes for the guests. The hotel is family friendly with children. Mali Here guests can play in the specially designed playground. Adults can relax in the flowered garden where you can have a barbecue. Playground is equipped with a large sandbox, a house with mebelkami, slides, tree house, inflatable trampoline, a swimming pool in season. Our parking lot is designed for 50 cars. Parking area is 10 acres so no problems can be parked buses and vans. In addition to dining rooms in our buildings have outdoor terraces of the beautiful greenery where meals are served to our guests. For relaxation, guests can enjoy a Finnish sauna, six-person Jacuzzi and solarium. The hotel is located at the edge of the city.